The necessary fix for the city’s traffic signal timing woes is the same today is it was back in the analog era: namely, signal cycle lengths need to be reduced. Cycle length is the amount of time it takes a traffic signal to cycle through its green, yellow and red phases. To coordinate signals, the intersections must have the same cycle length (or a whole number multiple). If two intersections have respective cycle lengths of 60 and 110 seconds, they can’t be coordinated. So an entire grid of intersections needs a single common cycle length. Longer cycle lengths create longer green lights, but also longer red lights. That means long bands of green time for traffic to move between intersections, but also longer stop times when the cars get to a red light. The same is true for pedestrians. If you don’t make it through an intersection on the “walk” phase, you have to wait a long time for the next one. 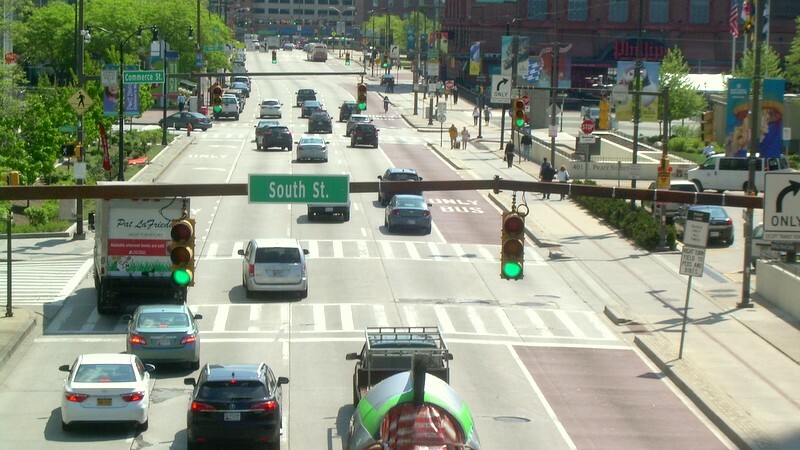 There’s a reason why major streets are called “arterials.” Traffic signal timing regulates the city’s blood flow and the pressure exerted on people and traffic moving through it. It’s not just the age-old conflict of cars versus people. At a long red light, some folks resort to multi-tasking – making a phone call or checking their text messages. Some remain ready to pounce on the gas pedal at the moment green returns, while others zone-out completely until someone honks at them. A high-stakes, conflict-ridden traffic flow invariably makes the city a more irritable and less safe place. Way back in the analog era, Philadelphia decided to reduce the common signal cycle length in its Center City urban grid to 60 seconds – in contrast to downtown Baltimore’s longtime peak period cycle length of 110 seconds. Philadelphia’s green and red traffic signal times are consequently much shorter. There is much less pressure for traffic to get through as many green lights as possible before they turn red. 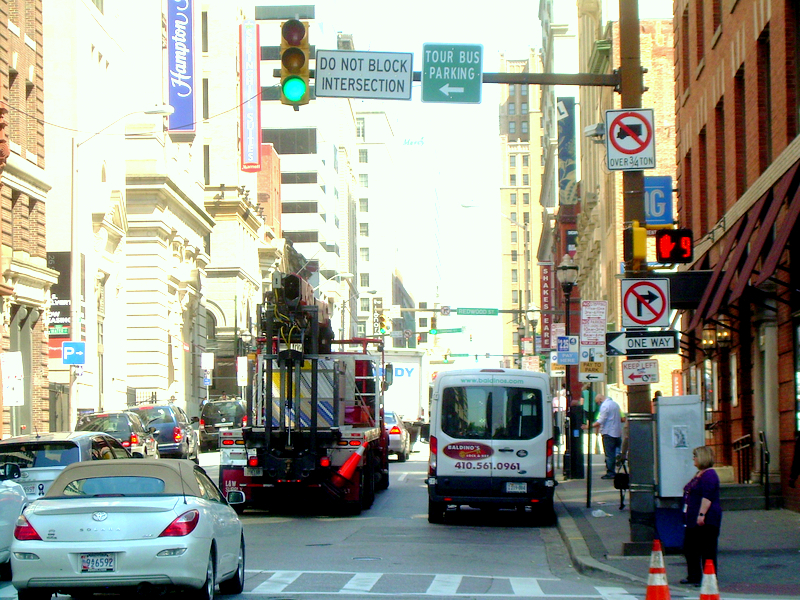 With short cycle lengths, Philadelphia has been able to eliminate pedestrian signals entirely at many intersections, relying instead on the basic traffic rule that if a pedestrian is in an intersection, drivers need to wait until they’ve cleared out. In contrast, Baltimore has increased its reliance on “beg buttons” for pedestrians to get a “Walk” signal (here and here). This disrupts the signal coordination between adjacent intersections, making traffic backups even longer. With short cycle lengths, Philadelphia has been able to eliminate pedestrian signals entirely at many intersections. What’s more, the ergonomics of “beg buttons” are often terrible. Located wherever the signal pole happens to be, the buttons are poorly labeled with too much or too little instruction. Usually you don’t know whether the damn thing works anyway. Even people who press the button often don’t wait around to find out. City DOT says that “beg buttons” are used where pedestrian volumes are not high enough to warrant full-time accommodation of their needs. Do they really mean that the Inner Harbor doesn’t get enough pedestrians? Traffic signal actuation for cars is no better than “beg button” actuation is for pedestrians. Any disruption in the timing pattern between intersections reduces the coordination of signals in the grid. That’s why Philadelphia decided the answer was to get back to basics. Reducing the common traffic signal cycle length lets cars and people quickly take their turn crossing through an intersection. Shorter green lights discourage cars from trying to speed through as many lights as possible before they turn red (the Grand Prix effect), while shorter red lights mean fewer delays for everyone. And, most importantly, drivers and pedestrians alike will be more aware of what’s going on around them and less focused on the traffic lights themselves. “Synchronization” and high-tech equipment might sound good to politicians and bureaucrats. But devising shorter traffic cycle lengths will, cheaply and efficiently, lower the city’s high blood pressure and promote a more peaceful coexistence between cars and people. A former transportation planner at the Department of Planning, Gerald Neily edits the blog, Baltimoreinnerspace.blogspot.com. In a turnaround for Baltimore, the city’s 2020 budget requests zero dollars for bike infrastructure. Amazon HQ2’s location in suburban Virginia should spur the consolidation of MARC and VRE service, a journalist argues.